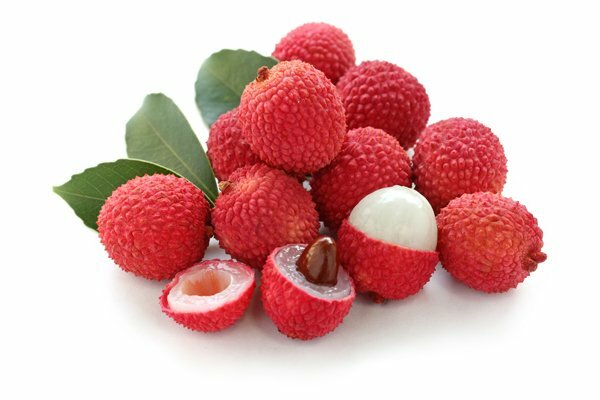 The lychee is the most renowned of a group of edible fruits of the soapberry family and widely known as litchi. On the Tree the fruit is in pendent clusters of 2 to 30 are usually strawberry-red, sometimes rose, pinkish or amber, and some types tinged with green. Very aromatic, oval, heart-shaped or nearly round, about 2.5 cm wide and 4 cm long. It has a thin, leathery, rough skin that is easily peeled when fresh. The flesh is white to clear or pinkish fleshy deliciously juicy that resembles a luscious grape. The flavour of the flesh is subacid and distinctive. No Mai Chee or Salethial :- The skin is smooth and Maroon / purple and the seed is often small and shrivelled. Fi tsz siu : – Is large, amber-coloured, thin-skinned, with very sweet, very fragrant flesh. Seeds vary small. It ripens early. Kwai May Pink / B3 :- The skin is rough tinged with green and pink to orange. It has a more cinnamon flavour and is heart-shaped. The seed is larger than Salethial. Tai so :- This is somewhat egg-shaped; skin rough, bright-red with many small, dense dots; flesh firm, crisp, sweet, faintly streaked The seed is large. Wai chi :- The fruit is round with medium-smooth skin, a rich red outside, pink inside; and leaking juice. This is available late in season. The seed is smiliar to Kwai May Pink. November - January : From Far North Queensland. December - January : Central Queensland. January - Feburary : Southern Queensland. Feburary - March : Northern N.S.W. Place the mango flesh in a liquidiser, puree until smooth. Cover and refrigerate until smooth. Cut the banana in half lengthways, place cut side up and arrange 3 / 4 kiwi slices on top, without overlapping them. Repeat with the lychee slices. Place the other banana half on top and then cut into three crosswise. Repeat with the remaining bananas, kiwi and lychees. Place a spring roll wrapper on the work surface with a corner facing you. Place a stuffed banana horizontally across the middle of the wrapper. Sprinkle a little lemon zest and brown sugar over the fruit, then fold the bottom corner of the wrapper over the banana and tuck it under. Fold in the sides and roll the banana almost up to the end. Brush the top corner with a little egg white, roll up and press firmly to seal. Repeat with the other bananas. Preheat 2 inches of oil in a large frying pan or wok and fry the rolls, 3 at a time, until golden brown, about 4 minutes, turning occasionally. Remove with a slotted spoon and drain on kitchen paper. Repeat with the rest of the rolls. Dust with the icing sugar and serve immediately with a little of the fresh mango sauce, decorate with lychees. The papaw (paw paw) is the largest edible fruit native to America. Individual fruits weigh 150 grams to 1kg and are 10-30cm in length. The larger sizes will appear plump, similar to the mango. The fruit usually has 10 to 14 seeds in two rows. The brownish to blackish seeds are pepperish in taste. The flesh is yellow to yellow-orange inside. The fruit is typically eaten out the hand and when fully ripe it is slighty soft to the touch with a golden yellow skin The flesh may be scooped from the skin and eaten. 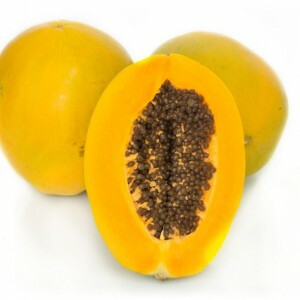 Though the exact area of origin is unknown, the papaya is believed native to tropical America, perhaps in southern Mexico and neighbouring Central America. Generally, the fruit is melon-like, oval to nearly round, or elongated club-shaped, 15-50 cm long and 10-20 cm thick. The skin is waxy and thin but fairly tough. When the fruit is green and hard it is rich in white latex. As it ripens, it becomes light- or deep-yellow externally and the thick wall of succulent flesh becomes aromatic, yellow, orange or various shades of salmon or red. It is then juicy, sweetish. 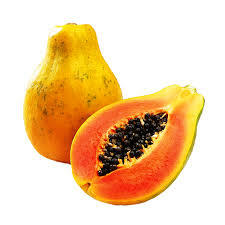 Ripe papayas are most commonly eaten fresh, merely peeled, seeded, cut in wedges and served with a half or quarter of lime or lemon. Sometimes a few seeds are left attached for those who enjoy their peppery flavor but not many should be eaten. Unripe papaya raw green papaya is frequently used in Thai and Vietnamese cooking. Even for use in salads, it must first be peeled, seeded, and boiled until tender, then chilled because of it’s latex content. 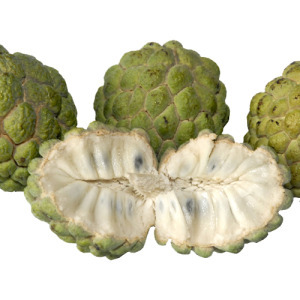 The custard apple is believed to be a native of the West Indies but it was carried in early times through Central America to southern Mexico. It has long been cultivated and naturalized as far south as Peru and Brazil. In Cuba, it is mamon or chirimoya. Some Central Americans give it the name anona, or anonillo. It is commonly grown in the warmer the tropical / subtropical climates of Australia. Pinks Mammoth :- Which is more heart shaped and is sweet and creamy. African Pride :- This has less carpuls (i.e. pumps on the skin) and typical has more seeds than the Pinks Mammoth. The fruit is typically eaten out the hand and when fully ripe it is soft to the touch and the stem and attached core can be easily pulled out. The flesh may be scooped from the skin and eaten as is or served with light cream and a sprinkling of sugar. Often it is pressed through a sieve and added to milk shakes, custards or ice cream. I have made a delicious sauce for cake and puddings by blending the seeded flesh with mashed banana and a little cream. Persea americana, or the avocado, is believed to have originated in the state of Puebla, Mexico, though fossil evidence suggests similar species were much more widespread millions of years ago, occurring as far north as California at a time when the climate of that region was more hospitable to them. The modern English name is not etymologically related to the similar-sounding Spanish word abogado, meaning ‘lawyer’ (as in advocate), but comes through an English rendering of the Spanish aguacate as avogato. Like the banana, the avocado is a climacteric fruit, which matures on the tree, but ripens off the tree. Avocados used in commerce are picked hard and green and kept in coolers at 3.3 to 5.6°C until they reach their final destination. Avocados must be mature to ripen properly. Generally, the fruit is picked once it reaches maturity; for ‘Hass’ avocados this is approxiamtely 23% dry matter or more. 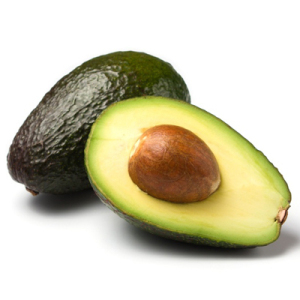 Once picked, avocados ripen in one to two weeks (depending on the cultivar) at room temperature (faster if stored with other fruits such as apples or bananas, because of the influence of ethylene gas). Some supermarkets sell ripened avocados which have been treated with synthetic ethylene to hasten ripening. The use of an ethylene gas “ripening room”, which is now an industry standard. In some cases, avocados can be left on the tree for several months, but if the fruit remains unpicked for too long, it falls to the ground. The two main varieties grown in Australia are Hass and Shepards. The ‘Hass’ avocado is today the most common. All ‘Hass’ trees are descended from a single “mother tree” raised by a mail carrier named Rudolph Hass, of La Habra Heights, California. Hass patented the productive tree in 1935. ‘Hass’ trees have medium-sized (150–250 g), ovate fruit with a black, pebbled skin. The flesh has a nutty, rich flavor. This is a small avocado, has delicate smooth green skin and a pointed. This variety will soften when ripe but unlike the ‘Hass’ variety, the skin WILL NOT change colour. It has an acorn-shaped pit embedded in rich, sticky flesh. A relative of the ‘Hass’, it has its obvious similarities in texture, but with a thicker almost gluey consistency. 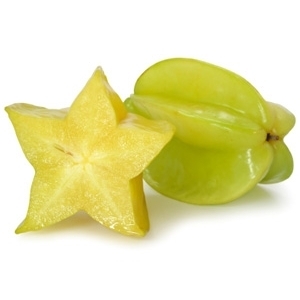 Carambola (also known as Star Fruit) when cut in cross-section has the form of a star. It is oblong with 5- to 6-angled fruits, 6 – 15 cm long and up to 9 cm wide. It has a thin, waxy, orange-yellow skin and juicy, crisp, yellow flesh when fully ripe. The fruit can also be deep green and ripe. Ripe carambolas are eaten out-of-hand, sliced and served in salads, or used as garnish on avocado or seafood. They are also cooked in puddings, tarts, stews and curries. In Malaya, they are often stewed with sugar and cloves, alone or combined with apples. The Chinese cook carambolas with fish. Thais boil the sliced green fruit with shrimp. Slightly underripe fruits are salted, pickled or made into jam or other preserves.